Be the first to hear about their new releases and deals. Download the Booksprout app and search for Corinne O'Flynn today! Corinne O'Flynn is a USA Today bestselling author of fantasy and mystery novels. 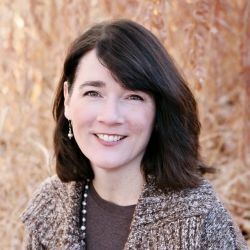 in 2018 she was named Independent Writer of the Year by Rocky Mountain Fiction Writers. She is the author of The Expatriates fantasy-adventure series, Witches of Tower Hill paranormal suspense series featuring the award-winning GHOSTS OF WITCHES PAST, the Aumahnee Prophecy urban fantasy series, and the Half Moon Girls murder-mystery series. She is also a publisher with Wicked Ink Books, whose titles include the award-winning TICK TOCK: Seven Tales of Time and the award-winning, OFF BEAT: Nine Spins on Song and DEAD NIGHT: Four Fits of Fear. She's a native New Yorker living in Colorado who wouldn't trade life in the Rockies for anything. She is a self-proclaimed scone aficionado, a professional napper, and she has an entire section of her kitchen devoted to tea. She serves on the board of Rocky Mountain Fiction Writers. When not writing, she can be found hanging with her husband and their four kids, playing board games, knitting, reading, or binge watching some fabulous shows (while sipping tea).